Perfect for Family Gatherings and Golfing Enthusiasts, Eagles Nest is situated in Downtown Alpine Helen inside The Innsbruck Golf & Country Club. This 4 Bedroom 4 bath home perfectly sleeps 8. After Hiking or playing golf, soak your bones in the outdoor large hot tub or challenge the kids in the lower level game room with a regulation pool table, foos ball and flat screen TV! Upstairs the adults have a perfect open setting with high ceilings and openness to enjoy a less competitive atmosphere. 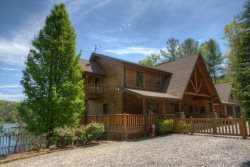 Eagles Nest is also close to other Pinnacle Cabins 3-8 bedroom homes for those family reunions and the need to sleep larger groups. Enjoy the Club House, Restaurant & Bar just a minute out your door. In the summer, enjoy the Swim & Tennis Facilities as well! Welcome to Eagles Nest, that perfect nesting place after a fun filled day! 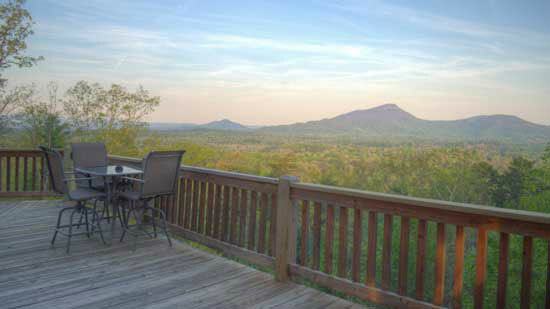 We always enjoying coming to Helen and book our stays with Pinnacle. Really enjoyed our stay at Eagles Nest. Was there for a wedding, wish we could have stayed longer. Beautiful property, everything was clean. The only negative was the wooden banister, 2 of our guests got splinters holding on. Excellent and professional team staff. Vacation home was wonderful. Had everything we needed and more. We will definitely be back. Enjoyed our time there. The only thing that I heard was the men folk couldn't find an western channel on TV. The kids enjoyed the game room.